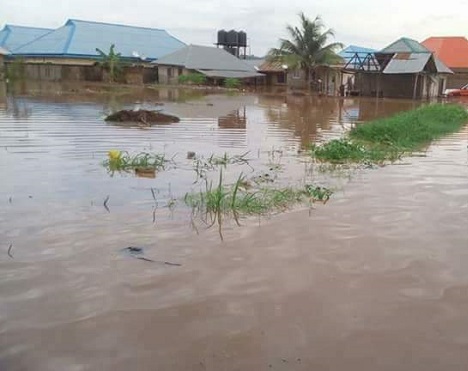 Flood has taken over parts of Otuoke community, hometown of former president Goodluck Jonathan in Bayelsa State, according to the News Agency of Nigeria (NAN). Otuoke is located in Ogbia Local Government Area of Bayelsa and one of the communities mostly affected by flood disasters. Some residents of the community now use canoes to assess their homes following the overflow of River Orashi-Taylor and Epie creeks, situated in Rivers and Bayelsa states, respectively. The flood had affected the house of Jonathan in 2012. One of the residents affected by the flood, Mr. Solomon Oru, called on the Federal Government and National Emergency Management Agency (NEMA) to come to their aid, as most of them now access their homes through canoes. He said most of their propertiy have been damaged by the flood. Oru also said the flood has dispatched reptiles around the communities, threatening lives. Another resident, Mr. Emmanuel Peter, said they cannot leave their homes, because thieves are looting their property. He also called for the intervention of the state government and security agencies for support and protection.